When Miss M was born she received a CD in her Read to Me! bag from the library and it had Jill Barber's song Baby's Lullaby on it. It was one of our favourites (especially since I was already a Jill Barber fan!) 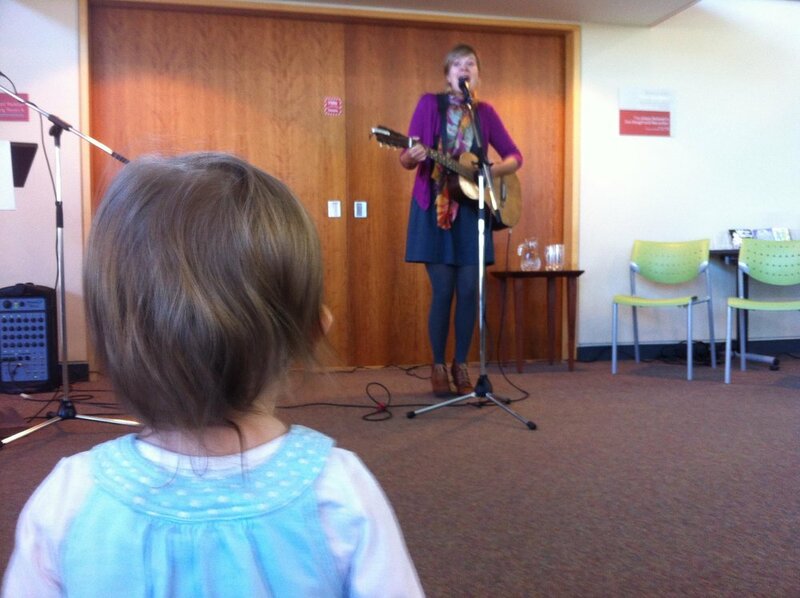 and when she released the accompanying book shortly after Miss M turned one year old, we went to the library to watch her perform it and to buy a signed copy from her. 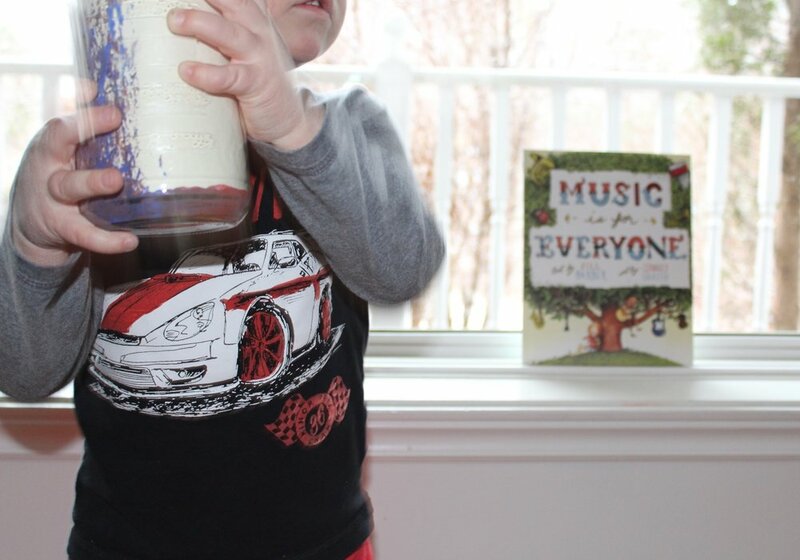 When we received Music is for Everyone by Jill Barber, illustrated by Sydney Smith, for this month's Itsy Bitsy Nimbus Book Club we were really excited and the book lived up to our expectations. The story is about how music is for everyone no matter their age, ability, race, lifestyle and it has beautiful images of children dancing and clapping and playing music all through the book. It touches on pretty much every genre out there, many that my children had never heard of yet. This led to a fun discussion about musical genres and I grabbed my phone and started pulling up examples of each type - which naturally led to an impromptu dance party! I was inspired by the fun, lyrical text and gorgeous illustrations to create an activity this month that also combined art and music for our Itsy Bitsy Nimbus Book Club. I was inspired by the book to create an art activity this month for our Itsy Bitsy Nimbus Book Club. 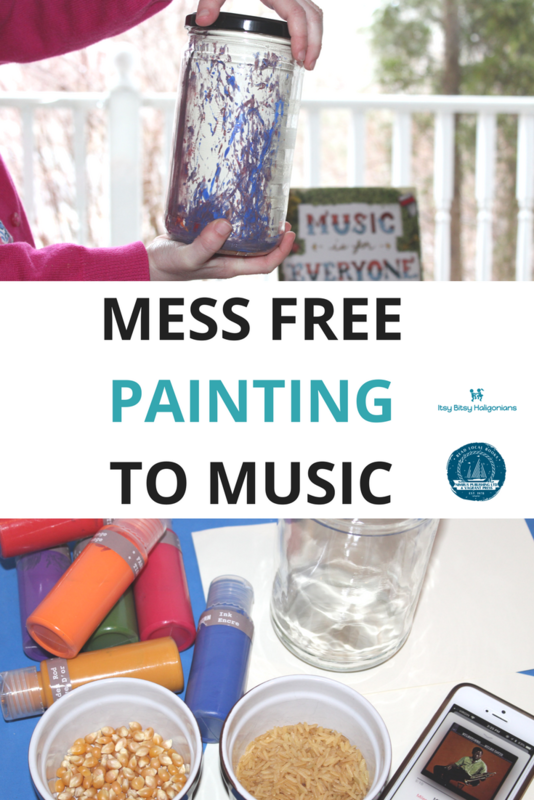 This activity encourages the children to explore the musical genres in the book further and they end up with a unique piece of art! Bonus, it's a mess-free activity so kids of all ages (and, yes, you parents will probably want a turn too!) can enjoy it. Wide mouthed empty, clean jar(s). Clear plastic works best and is safest. Variety of washable coloured craft paints. Cardstock cut to fit around the inside of the jar. 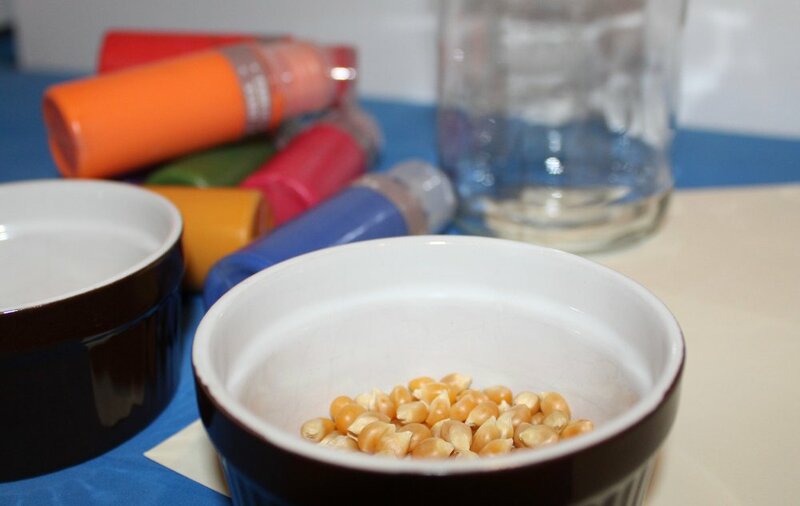 A selection of items to "shake" with such as popcorn kernels, marbles, uncooked beans, or small pebbles. A variety of songs from different musical genres queued up. Read the book Music is for Everyone, published by Nimbus Publishing, through once, and then read a second time and pause to play a selection of each type of music as it is mentioned. Make sure to allow for time to get down and boogie a lot! 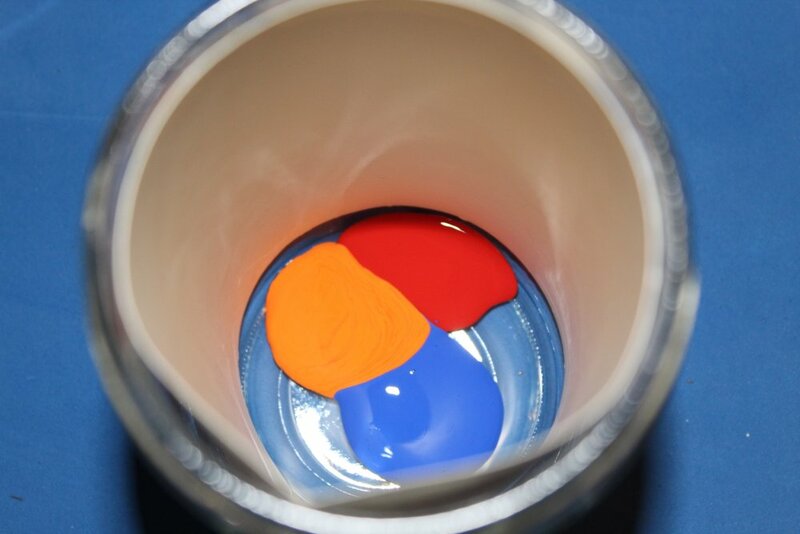 To start the painting activity slip a piece of cardstock into the jar and choose two to three paint colours. more than that and you'll likely end up with brown sludge. Drip a bit of each colour in, and then add a few shaker items (the pebbles, marbles, etc.) of choice. 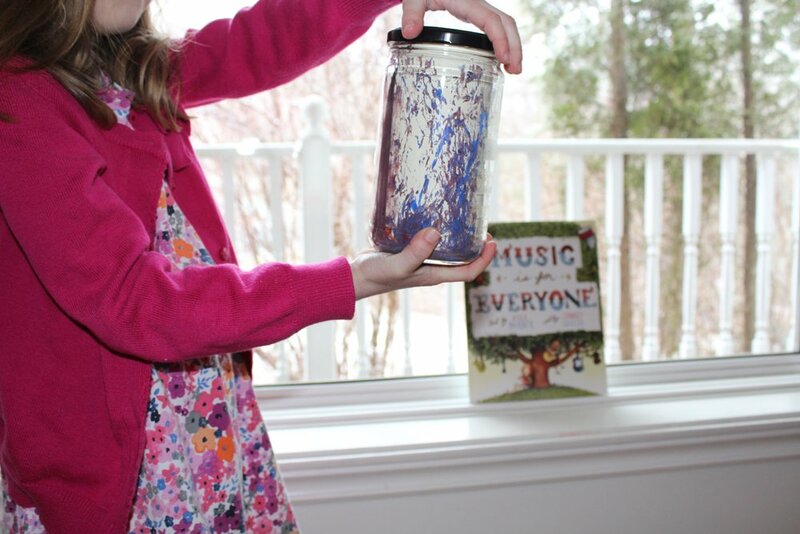 Turn on some tunes and have the children shake the jar while they dance to the music! Play freeze dance as part of it and have the children freeze in one spot while you play deejay and switch the genres. You may need to give it a good shake yourself every so often as we found our "shaker items" got stuck as the paint started to dry and needed a grown-up sized shake to loosen them up again. Two of our finished masterpieces - jazz and pop on the left; country and rock on the right! Try different types of music and shakers to see if there's a difference in the end result! Hot tip for the dozens of pieces of artwork that will result from this activity: This type of art is perfect for our kiddie greeting card art - see how to make it by clicking here. Another way to explore music and art is to create art to music. Set up an easel or spread out a large piece of paper on the floor and turn on a piece of music. Have the child draw or paint while they listen to the music. There are artists who feel like they "see" colours in music and create beautiful art from the colours it invokes. You can buy this book directly from Nimbus Publishing , or from one of the many local and national booksellers. We’ve teamed up with Nimbus Publishing to give away a copy of Music is For Everyone to one lucky reader. Click on this link and hop on over to Facebook. Then LIKE and COMMENT on the status in the link. One random winner will be drawn on Monday, April 16, 2018 at 8 p.m. AST. S/he will be notified by Facebook Messenger and have 24 hours to respond; if there's no reply by then, we will draw for a new winner. Good luck!